Please call or check the websites before driving long distances to obtain a discount. 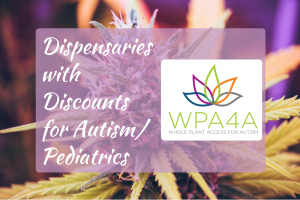 WPA4A cannot be responsible for a change in dispensary policy or discounts offered. If you know of a dispensary that offers a discount or a company that offers financial assistance to pediatric/autism families using cannabis, please let us know by submitting that information here. Harvesting Hope: Offers financial assistance for pediatric epilepsy patients using cannabis. Kannabis Works: Mention “WPA4A” and get a 15% discount on all purchases. Oklahoma Women’s Cannabis Association: Receive monetary assistance to help obtain a medical card. TJs Garden: They offer their medicinal CBD oil at no cost to children with their medical marijuana cards. Solevo Wellness 10% off for pediatric patient.